This section on telescopes is not designed to serve as a buyers guide, but to outline the popular styles of telescopes used today. For tips and advice on what type of telescope is good for you, a good starting point is Best Telescope Guide. NEVER USE A TELESCOPE TO LOOK AT THE SUN - without a proper solar filter. There are essentially three groups of telescopes: refractors, reflectors, and compound. A typical refractor will usually come looking like this. I think anyone who had an interest in astronomy as a kid had one of these - I know I did. I remember the first object I wanted to see which was - you guessed it - Saturn, everyone's favorite through a telescope. Image provided by Celestron. A common issue with any standard refractor is something called chromatic aberration. Recall a prism and how light is separated into fundamental colors of the rainbow. As such, a single lens will have difficulty focusing the red and blue (either side of the visible spectrum) to a single point. In an effort to correct this flaw, a second and sometimes third lens are placed together to ensure single focus. This is the apochromatic and not surprisingly the price can double or triple compared to a standard achromat. Image of the light path involved with a Newtonian style telescope. Image provided by Celestron. The light path of a Ritchey-Chretien design is similar to a Schmidt-Cassegrain but without a corrector plate. A style of Newtonian telescope called the Dobson - named after the style of mount - is a popular first choice for a beginning telescope. It offers a large aperture for a modest price. Image provided by Celestron. Reflecting telescopes eliminate any chromatic aberrations since light does not pass through anything - only reflected. There is another issue with reflecting (and poorly designed refractors) telescopes called coma. Stars will appear stretched towards the edge of the field of view. Coma is eliminated in the Ritchey-Chretien design since hyperbolic mirrors are used - and result in a higher manufacturing cost. This image illustrates what coma could look like. When looking though a Newtonian reflector, the stars the edge of view will look almost like comas, or comets. This affect is more pronounced during astrophotography. The view at the center will be unaffected. Compound telescopes use a combination of lenses and mirrors to focus the light. This image is of a Schmidt-Cassegrain type of telescope. A corrector plate eliminates the coma introduced by the standard Newtonian. Image provided by Celestron. The Maksutov-Cassegrain telescope uses a lens in place of a corrector plate. This helps overall color and eliminates coma. Image provided by Celestron. This image is typical of the Schmidt-Cassegrain type of telescopes available today. Celestron was nice enough to let use their images on this portion of the website, but oddly enough I have never looked through a Celestron telescope. This particular model is their NexStar series that boasts a fiber woven tube for light weight portability and faster cool-down times and also features the ease of GPS alignment and a computer for finding and tracking your favorite objects. These features are common on a wide variety of manufactures. While the Schmidt-Cassegrain's corrector plate eliminates the issues of coma, it does not eliminate coma completely. 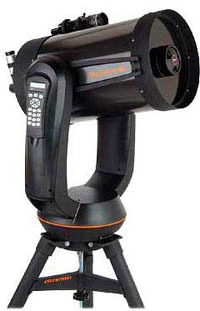 This is evident is astrophotography, and many seasoned imagers prefer the Ritchey-Chretien because its design eliminates coma completely. The Maksutov-Cassegrain uses a lens instead of a corrector plate to reduce coma, but to eliminate chromatic aberration, long focal lengths are required. As such, the Maksutov-Cassegrain	really is best suited for planetary work - and the optics can be quite good. For an inexpensive achromatic refractor, stay away from short focal lengths - anything greater than a focal length of f6.5 is good. Apochromatic telescopes are very expensive, and just like high end audio equipment, have their faithful following. Read reviews and look for yourself! 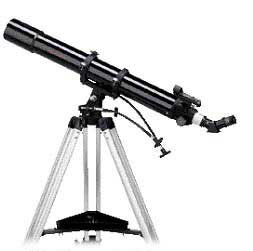 However, if you plan to use the telescope for astrophotography, an apochromatic telescope is necessary. Meade and Celestron are the two main producers of the Schmidt-Cassegrain telescope. There is not a clear winner as to who is best, but Meade tends to include more electronic wizardry into their scopes - which is fine if you like that sort of thing. Truth is, competition between these two companies is good for the consumer as the need for better and cheaper telescopes are released often. Go to a local Astronomy Club or "Star Party" - a gathering of like minded folks flocking to a dark location for a night of fun filled observing. There are sure to be a variety of telescopes, and most are willing to let you take a peek. Astronomy and Sky and Telescope magazines will have a list of national events. Collimation means adjustment of the light path. Reflecting telescopes use a small secondary mirror to focus the light toward an eyepiece, and the alignment can suffer due to excessive movement of even violent temperature changes. Devices are available at your local telescope store to help correct this condition.